HARTFORD – State Representatives Jason Perillo, Ben McGorty and State Senator Kevin Kelly took their oath of office on Wednesday, commencing the 2019 legislative session. The lawmakers will be entering a “long session”, which will run from January 9th to June 5th. During the long session, the lawmakers are able to propose legislation and will be tasked with framing a two-year state budget. Rep. McGorty added, “We are already starting to see many legislative proposals coming from the other side of the aisle that are looking to raise taxes and place tolls throughout our state. Shelton residents can trust that we will be fighting against tolls and tax increases. We will be working on legislation that will decrease taxes and will keep residents and businesses here in Connecticut. During the 2019 Legislative Session, residents can expect lawmakers to debate hot button issues such as tolls, sports betting, and the legalization of marijuana. 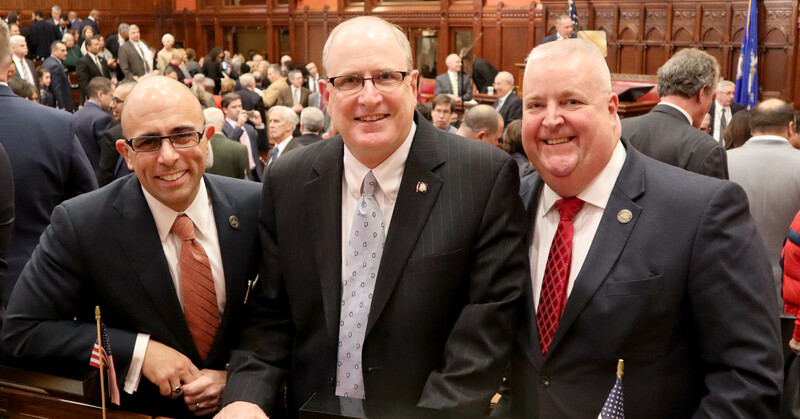 The lawmakers encourage residents to follow the legislative action by visiting the General Assembly’s website, www.cga.ct.gov, and signing up for their email updates. Residents can find Reps. Perillo and McGorty’s websites by visiting cthousegop.com and Sen. Kelly’s website can be found by visiting ctsenaterepublicans.com.